How many of you remember the girdles many of our mothers or grandmothers wore, to keep their tummies flat and their stockings up? To us, they may seem like instruments of torture. But a hundred and fifty years ago, women suffered much worse. Recently VPR’s Susan Keese attended a talk on the various contortions women have endured to mold their shapes according to the latest fashion -and about the undergarments that made those shapes possible. The talk was part of an exhibit at the Windham County Historical Society Museum in Newfane. 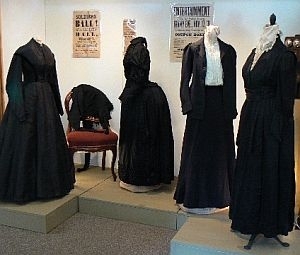 The show uses garments mounted on dressmakers forms to illustrate ‘the changing shape of women’s fashion’ from the 1850’s through the first World War.